DETAILS We have provided two templates for this project. One is in patriotic colors, the other is plain, inviting you to use your imagination for your own decoration. The instructions are detailed, so you shouldn't get into any trouble except when you bring the corners together with the pin. This requires manual dexterity. If your child is young, adult hands are probably best, thus avoiding both frustration and pricked fingers. 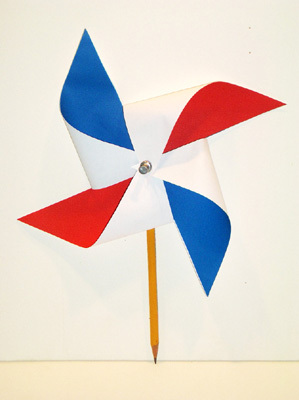 I envision our homemade pinwheels revolving as we carry them in our parade. Click for patriotic colors template. SKILLS NEEDED Scissors facility, ability to follow directions, manual dexterity for final assembly.